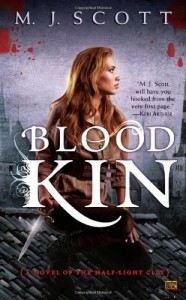 Blood Kin focuses around Holly and Guy, Simon's brother. We first met Guy, Simon and Lily, his wraith fiancée, in [b:Shadow Kin|9690444|Shadow Kin (The Half-Light City, #1)|M.J. Scott|http://d.gr-assets.com/books/1323380211s/9690444.jpg|14578543]. Unlike Simon who is a master healer, Guy is a Templar Knight and uninterested in romance or relationship. All that changes when Holly, a half-fae spy, literally falls into his lap. Since the Blood Lord's death things have changed. Despite Lucius' vicious nature, during his reign as Blood Lord the Night World had some degree of stability. Now, the treaty that sets laws for Humans, Fae, Blood (vampires) and Beast (shifters) is on the verge of fracturing. While on her quest for the answers her father demands, Holly meets Guy. As a spy, a Templar is the last person she wants to be involved with, but he is Simon's brother and this may prove useful. What starts off as a joint search for answers slowly turns into a mutual desire to protect each other at all costs. MJ Scott has created an interesting world where these four races struggle to find balance. This installment is half historical-ish romance, half spy novel. Although this is not the first book in series, the author does a great job of blending the events of book 1, [b:Shadow Kin|9690444|Shadow Kin (The Half-Light City, #1)|M.J. Scott|http://d.gr-assets.com/books/1323380211s/9690444.jpg|14578543], into this story, so those new to the series will not be lost.